sewhungryhippie: Shabby Chic Ruffle Clutch - A sweet sewing tutorial. 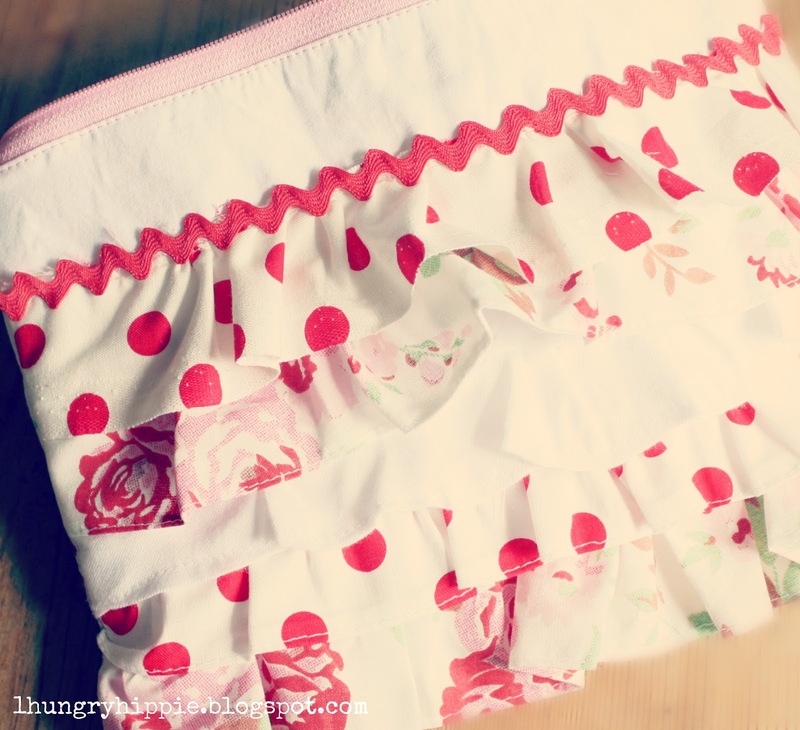 Shabby Chic Ruffle Clutch - A sweet sewing tutorial. I made this clutch in two different sizes. My favorite happens to be the smaller one, so that's what I'm teaching here in this tutorial. If you fancy the larger one at the bottom of this post, it is cut at 9.5x 7 inches. *Also, if the fabric you choose doesn't have a lot of body like this recycled denim does, interface the exterior pieces. 1. 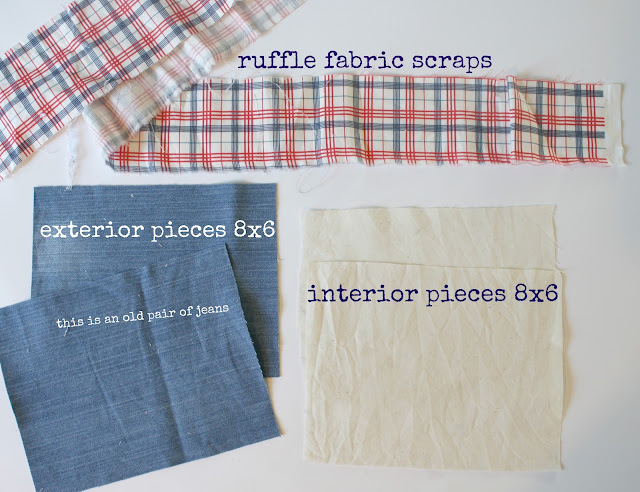 Cut the exterior, interior, (interfacing if using fabric mentioned above), and ruffle bits. Need help gathering? I have a cheat sheet here for fast ruffling. 4. Time to pin your gathered ruffle number one down, ready to sew. I work from the bottom up so that I don't catch my ruffles whilst sewing. 5. 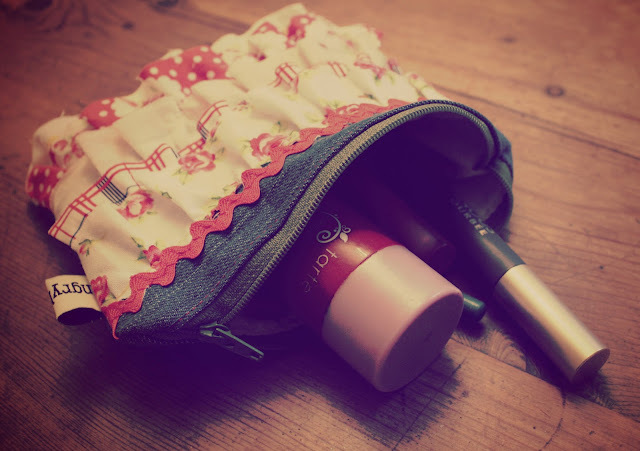 Sew them onto the exterior front piece, remembering to lower your stitch back to normal. ;) Yes, done that too many times to count as well. I left the back piece plain 'ol denim. I like that, makes me feel kinda shabby-chic-cowgirl-ish. Now we add the zipper. Don't be scared. I don't own a zipper foot, we can do this together. Nuthin' to it. 8. Lay /lie? help grammar police---the exterior front piece down right side up. Then put the zipper teeth side down, with the pull tab on the left. Now put the interior piece with right side facing the zipper. So-right sides are facing each other, and the zipper is facing down, away from you. 9. Pin it all together. See how both edges of the body are at that top edge of the zipper? Look closely. 10. Sew it on carefully. Take your time. 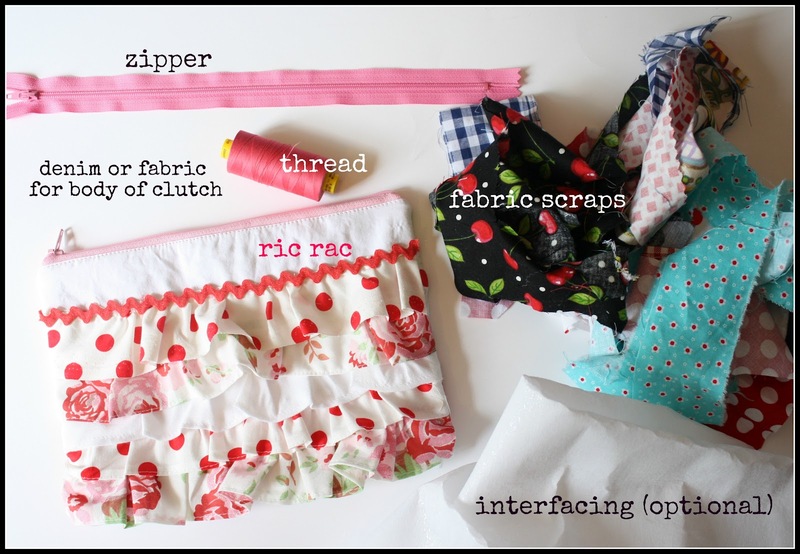 You may need to move your zipper pull tab at first to get started, then remove from the machine, slide it back into place again, and go on sewing. You can do this, just go slowly. 12. Top stitch that down for a nice, polished look. 13. Now repeat on the other side. Exterior piece right side up. Zipper teeth down (away from you) and pull tab on the right side now. Interior piece right side facing the zipper. Another view, if it helps. 14. Finger press this newly stitched side, and top stitch the front. Make sure to flip that other finished side out, don't accidentally catch it in the sewing machine. Both sides are now top stitched, ready to make the clutch whole. 15. First, unzip that zipper at least half way across. 16. 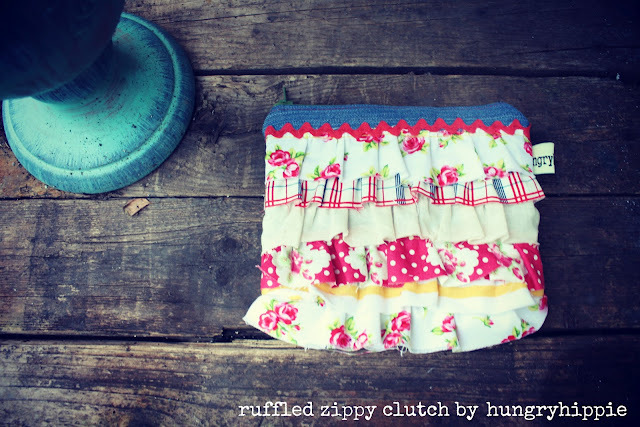 Pin the bottom ruffle up away from the bottom edge of the clutch so it isn't caught in the sewing of the clutch. Oh dear, it's getting dark outside....losing my light. Bare with me in the next few photos. 17. Okay, so here is how we assemble it. Right sides together, exterior to exterior pieces, and interior to interior piece. Pin. 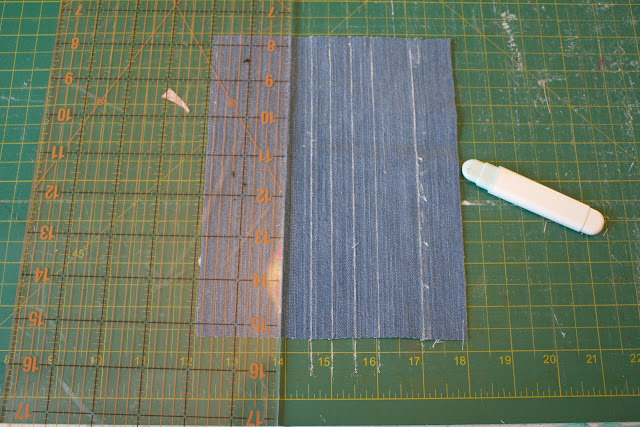 Sew around the entire edge, leaving open a space for turning on the bottom of the interior pieces. *Sometimes I sew across that turning space too, with a lengthened stitch -a baste stitch. Then I take the stitches out, press, and the edge is much neater to sew closed. I learned that niftly trick from Michelle Patterns . See my red thread? That's for you to see where I sewed. Sewed? Is that ....oh never mind. 18. Turn it right side out. 19. Press the opening closed and stitch it shut. Some people like to slip stitch, but I can't be bothered with that. I just sew it with the machine, that's cool enough for me. If you run into trouble, shoot me an email. I'm here to help. Yeah, that's my makeup. 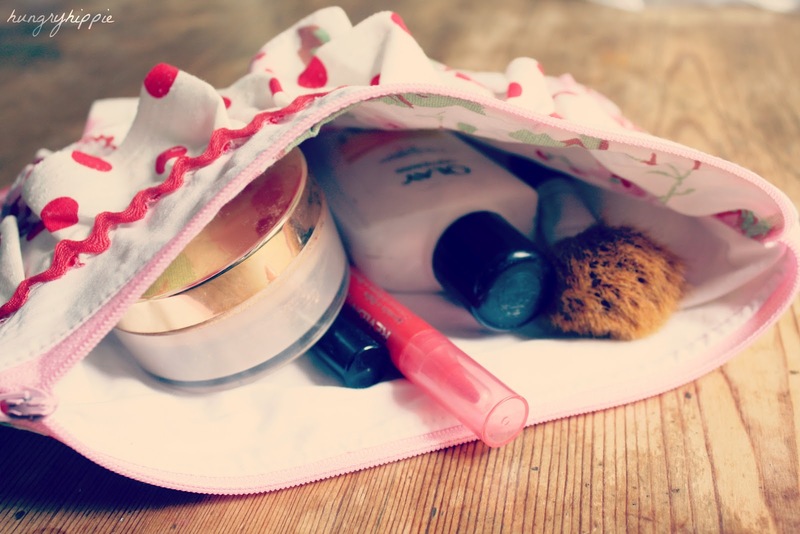 I'm a mom, so it's powder, Olay moisture, and lip stain. OMgosh is that really a "Wet 'n Wild" eyeliner there? Embarrassing. Thank you for your kind comments on my blog, I can't email you back because you're a no reply blogger! Adorable! Great tute, girlfriend. You're so clever. what a cute little ruffle clutch!!!! Love it. I am sure that I will be making a few of these as Christmas gifts. I love that you used some old jeans for the base. Great way to repurpose. Nice job on the tutorial. 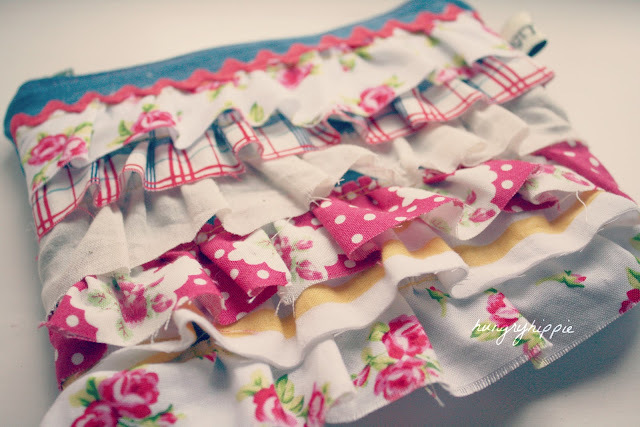 So pretty, I do love ruffles! I am looking forward to making some of these. They are so cute and you did a great job on the tutorial. Thanks! You got a very creative mind for making gifts like this. Just lovely. Can't wait to make one. Thank you for tute. I struggled a little with getting the zipper to lie flat, but otherwise it worked perfectly! 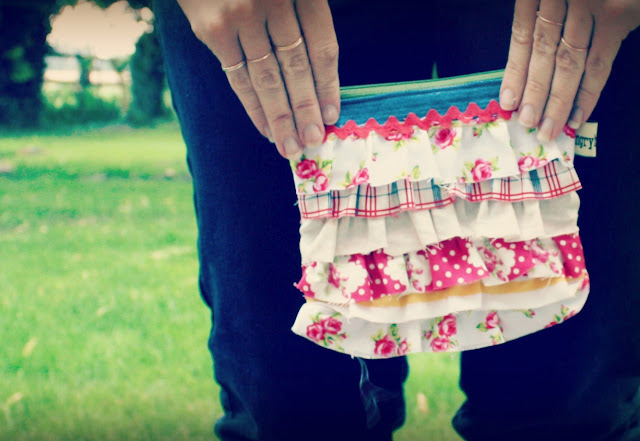 I even added loops to make it a belt pouch - great tutorial! !